There are so many beautiful WordPress themes out there. With beautiful demos where you can see those themes in action. However, when you install that theme on your site it looks nothing like the demo. Wouldn’t it be better if you could see a preview of how it would look on your site? In this article, I am going to show you how to preview your WordPress theme before it goes live. If you are switching theme on a live website, you need to preview your new theme to ensure that it looks correct. One way to do this is to set up a demo website that has the same content, theme, and plugins installed. Many website owners do this to avoid any downtime during the switch. Another option is to preview your new theme directly through your WordPress admin area. Once you have installed a theme you would see a Live Preview button below the theme’s thumbnail. Clicking on the Live preview button will open the theme in WordPress theme customizer. Depending on what theme you are using, you can make changes to your theme using different controls in the left pane on the preview screen. 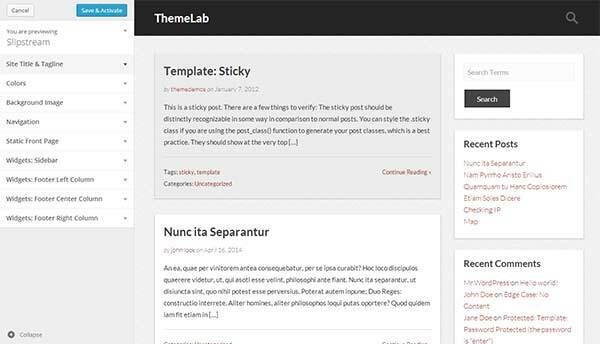 All ThemeLab themes make it super easy for you to setup your site completely from theme customizer. This means that you can see the changes live on your website. You can even close the controls pane to view the theme in its full glory by clicking on Collapse button on the bottom left corner of the controls pane. 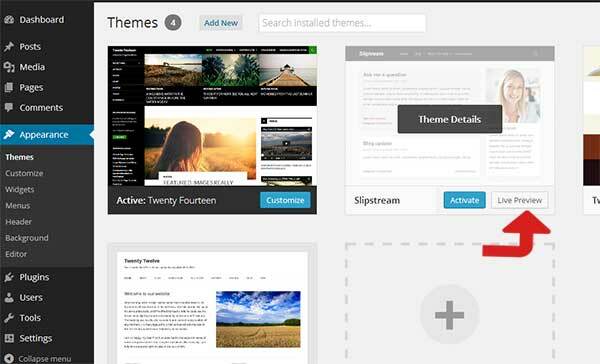 Theme Customizer in WordPress is a powerful tool, you can use it to set up a theme before activating it on your site. Since WordPress 3.9, you can even add and setup widgets from the Live Preview screen. Once you are satisfied with the preview and ready to go live, simply click on Save & Activate button. This will save your changes and activate the theme on your site. However, if you are not yet ready you can simply click on the cancel button to exit theme preview. All ThemeLab themes try to take the maximum advantage of this powerful customizer, making it extremely simple for users to set up their themes quickly without going through a crazy marathon of complex options. I hope this article helped you learn how to preview a WordPress theme without activating it on your site.